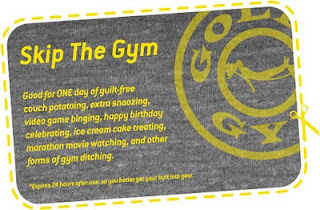 I thought, after all these years together, Gym knew me better than to give me this gift for my birthday. My birthday is always the day each year I run five miles (43:25 this year) to reassure myself that I'm not getting out-of-shape again. I'm so not a runner, so if I can do that, I can do anything. Gymy dearest, you should know this! Yet another reason you are SO much better than me. I totally took them up on this offer. I would keep the card and pretend it was my birthday every day. Muahaha.